Prince Charles Edward Stuart, aka Bonnie Prince Charlie, 1720-1788, was born and died in Italy. He landed in Scotland on the 23rd July 1745, stepping ashore on the island of Eriskay, Outer Hebrides, at the subsequently named Prince's Beach. He left Scotland for ever on the 20th September 1746. This escapade, the final Jacobite uprising, is sometimes called 'the '45'. As a consequence of this failed rebellion against the Hanoverian crown, the Highland way of life, particularly the clan system, though already changing because of economic factors, was dismantled on government orders. A series of Disarming Acts took effect. Wearing of tartan was even outlawed. Imagine that - because of Bonnie Prince Charlie, tartan was banned! The culture of the Gaels was seen as a danger to the nation’s stability and had to be broken up and absorbed by the Lowlanders. This policy to subdue the Highlands was carried out regardless of the politics of individual clans – not all of whom (in fact, far from it) were Jacobite sympathisers. (Pictured) The Prince’s Beach, on Eriskay, where Bonnie Prince Charlie first set foot in Scotland. He was told to go home. Some of these Highlanders must have known he was a heap of trouble. In fact, in the tide of sentimentality over the escapade, which gradually arose when the brutal events of the rebellion had long passed, it is easily overlooked that Charles’s cause was never overwhelmingly supported. He probably managed to raise much less than even half the fighting force in the Highlands – and many of these clansmen were coerced by their chiefs to turn up, follow and fight. What was Bonnie Prince Charlie trying to do? Beyond Scotland and England, the Jacobites had wide support in Continental Europe including Catholic Spain, Italy and, notably, France. The government in London, England, was extremely worried by the activities of the Jacobites and the threat which they represented to the British throne. Whatever the truth, the hot-headed young man left from St Nazaire in France with only two vessels, one of which was later engaged by the navy. The solitary ‘Du Teillay’ thus arrived in Eriskay, Outer Hebrides where the local Macdonald chieftain told him to go home. In true romantic fashion, Bonnie Prince Charlie said that he had come home – and hence the campaign got under way which was to change forever the Gaelic nation. Some writers argue that Bonnie Prince Charlie was encouraged by the French to invade Scotland as this was a time of poor relationships between Britain and France, linked to their rivalry over New World colonies. The French hoped Charles’s expedition would create a diversion and tie up the British navy in Scottish waters. Bonnie Prince Charlie figure on shortbread tin. This would leave unescorted British merchant ships in the southern North Sea an easier prey for French-sponsored privateers as well as making possible invasion easier. This view is decidedly ‘bigger picture’ – but a reminder that there were significances far beyond Scotland. (Pictured) One of the later results of Jacobite myth-making and subsequent sentimentality was to make Charlie into an iconic and romantic Scottish figure, ideal for, say, decorating shortbread tins. After the shortbread was eaten, these tins were often used for storage. Their capacity was measured in ‘Jacobytes’ – one Jacobyte being a very small unit. I mean, really, who is that effeminate looking creature in a skirt? I bet if he looked like that in real life he’d never have survived a summer hiding in the Highlands of Scotland. The midges would have killed him. Wait though, there’s more to the curious portraiture of this Jacobite hero. I found this old leaflet (1990s?) lurking in a file about the island of Eriskay. From it I conclude that the ‘illustrator’ was trying to tell us that young Charlie arrived with Viking back-up, though the one whose beard he was holding had only one arm. Weird. This was back in the days when local enterprise companies threw money at all kinds of projects. This one must have been called ‘Ugly Prince Charlie’. How did Prince Charles become ‘Bonnie’? Prince Charles Edward Stuart first became ‘Bonnie Prince Charlie’ on a particular occasion: Tuesday 17th September 1745, the day he entered Edinburgh. He left his place of lodgings (Gray’s Mill at Slateford) and led his officers eastwards, though first looping a little southwards to avoid cannon from Edinburgh Castle. He held a short review of his forces and, ever the showman, allowed the gathering crowd quite a close view. Tall and handsome on his fine horse, he worse a tartan short coat, red velvet trousers and military boots. In short, he was a sensation and the local women, high born or not, went weak at the knees. This was when the Bonnie Prince Charlie label was first used. The crowd cheered and posh ladies threw lace handkerchiefs on to the street in front of him. He entered the Palace of Holyroodhouse to adulation - a real pop-star welcome. All this according to Bonnie Prince Charlie by Frank McLynn. Loch nan Uamh, near Arisaig – the arrival and departure point for the Prince on the Scottish mainland. The tall lighthouse-like monument that marks the locality was erected in 1815 and it isn’t the prince on top. It’s just a kilted Highlander. (More on the monument below.) Visitor Centre nearby (National Trust for Scotland) tells the story of the ’45. The Glenfinnan Monument (pictured here) is a very popular stop on the Fort William to Mallaig road. However, these days probably more people visit the locality to view the Glenfinnan Railway Viaduct, associated with Harry Potter films. You can see the relative position of the two locations in this picture, taken while afloat on Loch Shiel. The Glenfinnan Monument (on the right) from Loch Shiel. The figure on top is just a generic Highlander, rather than a statue of Charlie. More interesting for many visitors is the Glenfinnan Railway Viaduct, seen in the background. Corrieyairack Pass, near Fort Augustus – ironically, the Prince’s army went south via the military roads built by General Wade to ensure that government troops could move quickly in the event of rebellion. The highest of these military roads (finished in 1732) crossed the Corrieyairack Pass at 2,500 ft.
Blair Castle, Perthshire – closely associated with the Jacobites as the prominent Murray family who lived in the castle had been split by the rebellion, with brother opposing brother. Later in the rebellion, with Blair Castle garrisoned by government troops, Lord George Murray, who became the Prince’s very competent Lieutenant General, laid siege to his own home. Blair became the last castle in Britain ever to be besieged. Vistors today can still see the cannonballs used! Stirling Castle – the Prince and his supporters came via Perth to Stirling on their way south, though it was on their way back north that they tried and failed to capture the stronghold. Edinburgh – the Jacobites entered unopposed, on the 17th September. Edinburgh Castle was firmly held by government troops. Bonnie Prince Charlie took up residence at the Palace of Holyroodhouse (pictured here) instead. At the Battle of Prestonpans (21 September) east of Edinburgh, Jacobites routed the government army under General Cope – an event recalled in the popular Scottish song ‘Hey, Johnnie Cope’. They then continued south. The Jacobite army crossed the border near Kelso and took Carlisle, Manchester and Derby, only 127 miles from London. However, support diminished and, with government armies converging on them, the Jacobites turned back. Glasgow – the Jacobite army returned to Scotland, passing through Dumfries and Galloway and the Clyde Valley (where the locals were somewhat hostile) to reach Glasgow, already a mercantile city, trading with the Americas. While here, Charles demanded 12,000 shirts, 6,000 coats and 6,000 pairs of stockings for his ragged army – perhaps finding them in the early shops of what has become the ‘Merchant City’. He also took advantage of its nightlife, attending balls and going out to dinner, as well as reviewing his troops on Glasgow Green. Falkirk – here they had their last victory, in severe winter wet weather that caused government musketry to misfire. The Jacobite forces defeated another government army under General Hawley, who had his lunch at Callendar House interrupted when the Jacobites attacked! Afterwards, Charles Edward Stuart caught a bad cold and stayed in Bannockburn House, before the Jacobites retreated northwards. The government forces regrouped in Edinburgh. For Bonnie Prince Charlie, the winter of 1745-6 must have been difficult. He still hoped for further support from France and even an invasion in the south of England. His clan chiefs, in an army permanently short of cash and provisions, must have had difficulty keeping their clansmen ‘on side’ – basically, his forces were gradually disintegrating. Meanwhile, representing the government of the day, the Duke of Cumberland waited for an opportunity to engage the rebels. Not seen Outlander yet? If you sign up for Amazon Prime - you get a free 30 day trial and you could binge on a quite a few episodes - there are 4 seasons now! Does Jamie survive the Battle of Culloden?! Inverness - this was Charles Edward Stuart’s base in the early months of 1746. Some actions took place, the Jacobites capturing Fort Augustus. Cumberland’s forces moved out of Aberdeen in April to finish the rebellion. Cumberland was King George III’s son and a distant cousin of the Prince. He earned the name ‘Butcher’ for his later actions, but had widespread support in Scotland and was given the Freedom of Edinburgh on his way north. Prince Charles Edward Stuart’s last battle: Culloden, near Inverness. View of Memorial Cairn, looking north. (Pictured) On the battlefield of Culloden, looking north, over the narrow (at this point) Moray Firth, to the Black Isle. This pic shows the battlefield memorial cairn. The white-ish dot above the cairn is a plane on its approach to Inverness Airport. Any other dots you see here mean you should clean your screen. At Culloden Battlefield (east of Inverness) the badly advised, outnumbered and outgunned 5000 Highlanders of the Jacobite army (along with a few Scots and Irish mercenaries from France) were no match for the Government army. The 'British Army' had 6400 foot soldiers and 2400 cavalry. It is often said that more Scots fought for the Hanoverian government than for Charles Edward Stuart. This in turn is a further reminder that the last battle fought on Scottish and ‘British’ soil was not an England versus Scotland conflict but instead the culmination of a civil war that damaged the Highlands of Scotland both economically and culturally. Did You Know? 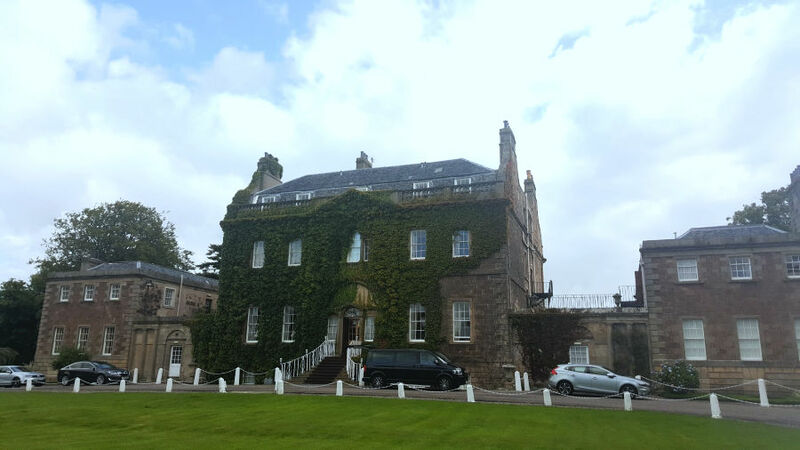 Bonnie Prince Charlie commandeered Culloden House as his battlefield headquarters for three days before the battle - it is now a fine hotel and you can stay there too - adding even more history to your trip. What happened to Bonnie Prince Charlie after Culloden? (Pictured) Bonnie Prince Charlie country. This is the sort of terrain through which Charles Edward Stuart was hunted after the defeat at Culloden. Here is a hint of the Rough Bounds of Knoydart, looking north to Kintail. His months of wanderings took him down Loch Ness and to the Outer Hebrides via Morar in the far west. His loyal supporters still gave him shelter. The soon to be famous Flora MacDonald risked her life smuggling him from South Uist to Skye, disguised as her maid. Tormented by midges, short of food, always aware of the soldiers on his trail, his route then took in the wild trackless country around Loch Morar again, and also by Loch Arkaig where Jacobite treasure is still said to be hidden. He got as far north as beautiful Glen Affric in Inverness shire, then as far east as remote Loch Ericht, north of Rannoch Moor. He kept a very low profile and was never betrayed. The scale of his wanderings in the Highlands of Scotland suggest that he was certainly very fit and hardy. Finally, he was taken out of Scotland by a French ship after a rendezvous at Lochan nan Uamh, his starting point, between Fort William and Arisaig. A peace treaty between Britain and France in 1748 included the condition that Charles was removed from French territory. Though he never returned to Scotland, curiously enough, he made a secret visit to London, England, in 1750, in an unsuccessful effort to re-ignite his claim to the throne. He died in Rome in 1788, aged 67. For further reading, I recommend just about anything by Bruce Lenman. Here's a selection of Jacobite history books on Amazon. So where exactly did Bonnie Prince Charlie rally the clans? Here's some more detail if you want to get off the beaten track at Glenfinnan! In 1975, a heather fire between today's road and railway burned away vegetation and revealed an inscription carved into the bedrock on a little knoll, close to the Catholic Church at Glenfinnan (designed by Welby Pugin, incldentally). The historian Iain Thornber believed the inscription was created by one of the MacDonalds of Glenaladale (where the Prince spent the night before arriving at the head of Loch Shiel.) He goes as far as to suggest it was one Reverend Father Donald MacDonald (1814-1895) who had built the nearby Catholic Church. There are also a few other nice places to stay in Glenfinnan too. Arisaig just a few miles further on is also a lovely location for a few nights. a bit more information. No, wait, it’s a ton of stuff about other interesting places with Jaocbite connections. Keep reading. You might even find the missing Jacobite gold. Ben Loyal from the Kyle of Tongue, Sutherland. (Above) Ben Loyal from the Kyle of Tongue. This mountain was a hiding place of a cache of French gold intended for the Jacobites. Is it still there? See entry below. Culloden: near Inverness. Today, the battlesite is in the care of the National Trust for Scotland. An important – and really excellent – visitor centre interprets the significance of the site. Cafe and well-stocked shop here too – for books and Scottish gifts! Fort William: West Highland Museum. Jacobite relics, including a secret portrait of Prince Charles Edward Stuart. Glenfinnan, west of Fort William: Monument erected in 1815. At least, a 65ft / 20m high stone tower was, adjoining which was a 'shooting box' or large room for the benefit of sporting/fishing visitors to the estate. This 'extension' was demolished about 20 years later. Then a statue of a Highlander was placed on top of the tower and a plaque set in to the tower wall. This was done by the estate owner to commemorate the Raising of the Standard, though the plaque wording ('On this spot...etc') has misled generations of visitors into accepting that they are on the actual spot where the clans gathered. More below. National Trust for Scotland information and displays in nearby Visitor Centre. Outstanding local scenery here looking down Loch Shiel. Blair Castle, near Pitlochry: The Prince stayed here. Jacobite relics on show. Prestonpans, East Lothian: Cairn commemorates the battlesite. Ground much altered by subsequent coal mining, though now landscaped. Palace of Holyroodhouse, Edinburgh: Prince Charles Edward Stuart held court here while in Edinburgh, in the royal residence built by his ancestors. Ruthven Barracks, Speyside: Originally built after the 1715 rebellion, the army garrison here held out against the Jacobites in 1745, but in the early months of 1746 had to surrender when the Jacobites returned with artillery. After Culloden, the defeated forces attempted to rally here, but finally blew up the barracks and dispersed. Fort George: East of Inverness. This extraordinary fortification was built in the aftermath of Culloden – Europe’s best and most intact example of an 18th-century fort – the London, England-based, government’s response to the threat (real or imagined) of rebellion in the Highlands of Scotland. It has never fired a shot in anger, but has been garrisoned since completion in 1769. Visitors can see round the fortifications, many of the interior buildings and also a major interpretation centre. Ben Loyal, Sutherland: (See picture above.) The Highlands of Scotland are the setting of a number of ‘Jacobite gold’ stories. Attempts were made by the French to send funds to the Jacobite army. A French treasure-ship ran aground in the north of Scotland and though the crew surrendered their gold, rumours persist that some of it was hidden. Some say the vicinity of Ben Loyal near Tongue is where to look – but nobody has found the treasure yet! Finally, if time is really hanging heavy on your hands, you should take a look at a whimsical conversation that might or might not have taken place at Glenfinnan, before the uprising got under way. You know, people actually write to me to say I'm not taking this seriously enough. See the blog called Incident at Glenfinnan.